What’s your favourite movie? Really, just one?! 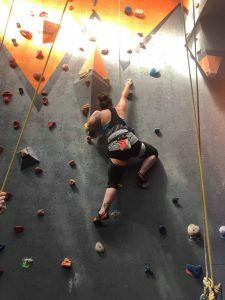 What are your personal climbing goals? Tick a grade 20 outdoors on lead, and a personal goal is to write a novel. Who is your favorite athlete who inspires you? Serena Williams, what a power house! What are your other hobbies/interests besides climbing? Hiking, stand-up paddle boarding, reading, writing and anything animal related. What advice do you have for newbies who are just trying climbing for the first time? Don’t give up after your first attempt, it may seem hard to start off with, but after a couple of weeks you will be so addicted that you won’t believe you nearly gave up. What’s the best part of your job at CIRC? The staff and regular customers, no matter how rough a day I’m having they all know how to make me laugh.